Wrapping up an amazing year! And that’s just about all there was to 2011. 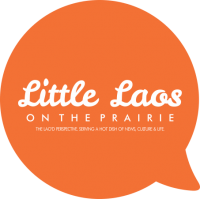 * The launch of Little Laos On the Prairie. A blog dedicated almost entirely to the journey of Lao Minnesotans? I like it! * Weddings! We saw several prominent Lao Americans get married this year including award-winning Lao American visual artist Mali Kouanchao and Little Laos On the Prairie’s own Chanida Phaengdara! * Lao American artists won several grants for this year, including Ladda Insixiengmay, who won a Minnesota State Arts Board Artist Initiative Grant and Mali Kouanchao who won a Metropolitan Regional Arts Council Next Step Grant. * Legacies of War at the Loft Literary Center. For one night only, Legacies of War exhibited at the Loft Literary Center in Minneapolis on June 15th as we closed an amazing year of engaging the community on issues of unexploded ordnance in Laos, with a special guest appearance by Catzie Vilayphonh. * Lao American writer Saymoukda Vongsay had her play performed by Mu Performing Arts, was declared a 2011 Changemaker by Intermedia Arts, and also joined the Intermedia Arts board of directors. She also received an honorable mention in the acclaimed Loft Literary Center’s mentorship program. * Nationally recognized Lao weaver Bounxou Chanthraphone is recognized for lifetime achievement in the arts by the Council on Asian Pacific Minnesotans. * Dr. Adisack Nhouyvanisvong is recognized for leadership in education as the founder of Naiku, an educational assessments company by the Council on Asian Pacific Minnesotans in May. His company, Naiku, also wins the division title of the acclaimed Minnesota Cup for Minnesota startups. * Miss Minnesota is Nitaya Panemalaythong. She is Lao American and will be battling for Miss USA. At 26, she’s the oldest contestant and entered because she was going back to school. But what were some of the highlights of the year for you?